Moroccanoil offers a revolutionary range of luxury haircare that guarantees healthier hair after just one application. Founder Carmen Tal decided to create the brand after experiencing a colouring disaster that completely damaged her hair, forcing her to get an emergency treatment. This was based on argan oil, which managed to get her hair to look smooth and shiny again. For this reason she committed herself to the mission of spreading this miracle-working oil across the globe. As the pioneer of a new oil treatment category, Moroccanoil has quickly gained great success among stylists and celebrities. What makes these hair products so effective is the advanced infusion of antioxidants and nutrients that leave the hair bright and nourished. 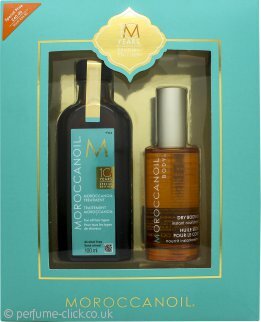 Moroccanoil is a great choice if you are looking to add the wonders of argan oil to your everyday routine. Try the hydrating shampoo or conditioner or treat damaged hair with the intense oil treatments and hair mask.